As I near the end of my pregnancy, I have found standing over the stove is often the last thing I want to do. It’s funny because I’ve been fairly active this pregnancy. I’m not sure if it’s because it’s the end of the day or what, but I have found that I’m in no mood to be cooking long, complicated meals. It’s quite tempting to just order in or beg Good Papa to cook dinner (I’m lucky… he often does!). Instead, I’ve been scouring pinterest for quick and easy meals or falling back on my go-to meals that I know take no time at all. 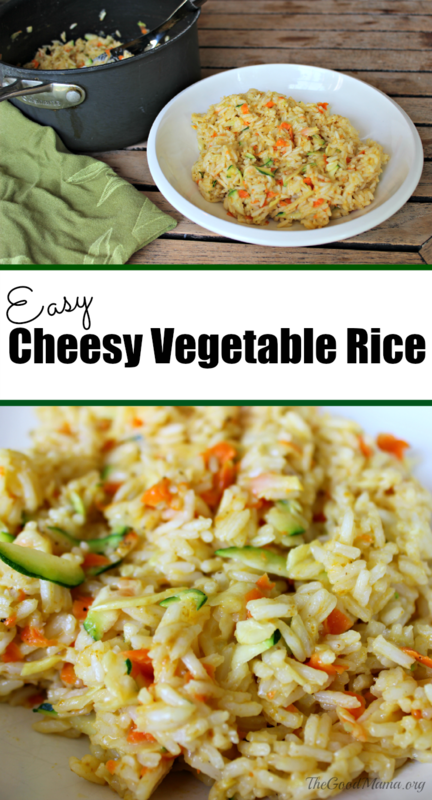 My Easy Cheesy Vegetable Rice Recipe is one of those go-to meals. 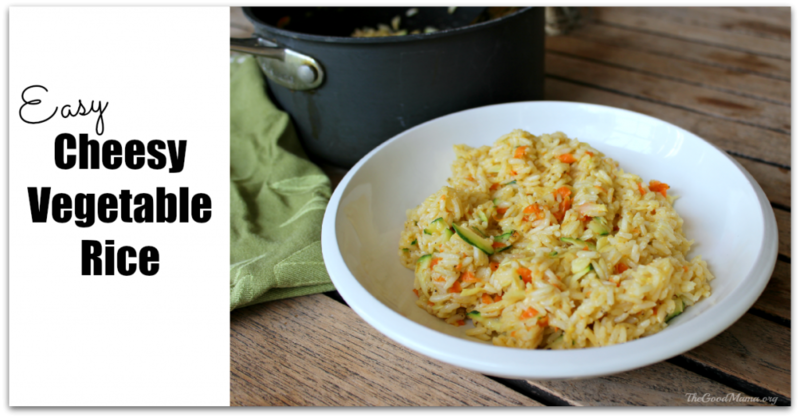 It’s a spin on another recipe I pinned a while back called, Cheesy Zucchini Rice from Buns in My Oven. Ever since I saw that recipe, it has been my go-to for a quick, easy side dish. I decided to change up the recipe a little by taking out the butter and adding in some more veggies (you can’t ever get enough veggies, right?). 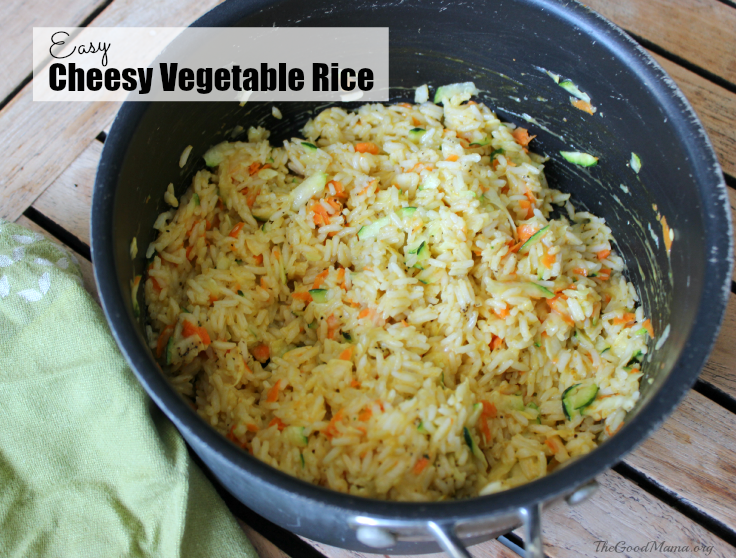 Since W loves rice, this is a great meal to sneak in some extra veggies. He ate the yellow squash no problem in this dish, but I know he may have turned up his nose if it was on it’s own. So, if you’re looking for a tasty way to use up all that zucchini you may have lying around, you have to try this simple dish. 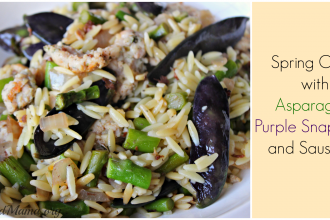 This delicious side dish could not be easier to make. It only takes one pot and about 25 minutes! You could use of food processor to grate all the vegetables or you could just grate them with a box grater like I did and save yourself from washing the entire food processor. Just be sure to drain the zucchini and yellow squash of excess water before you add it to the dish. I added carrots, zucchini and yellow squash because they looked good at the grocery store (and I love colorful dishes), but really you could mix it up with what vegetables you decide to toss in to this dish. I think parsnips or even radishes would probably be a good addition. To make this dish, all you have to do is cook rice according to the package then toss in the shredded veggies and cheese. That’s it! Bring rice and broth to a boil in a pot over the stovetop. Then, reduce heat, cover and bring to a simmer for about 15 minutes. Then, take pot off heat and let sit for 10 more minutes. While rice is cooking, shred squash, zucchini and carrots. With about 5 minutes left add shredded vegetables and cheese. When 10 minutes are finished, use a fork to stir cheese and veggies into the rice. This looks delicious! I recently went vegetarian and am always looking for dishes that could pass the meat lovin hubby test, and this one looks like a keeper! Yes, I love that this is a vegetarian dish too. I hope your husband likes it! Tricia the Good Mama recently posted…Surfset Fitness Review- Ride the Wave! This looks delicious!! I am definitely adding this to my list of recipes to try! Oooo this sounds all sorts of tasty!!!! Always looking for side dish ideas!! I just made this for dinner tonight and it was great!! I love that the grated zucchini and carrots don’t add a strong vegetable taste, but that they add extra nutrients (my husband is not a vegetable lover). It’s a great way to sneak in some extra veggies but still have something that tastes awesome! Thanks for sharing your recipe! I’m so glad you liked it! I make this dish a lot because it’s SO easy. I’m always trying to sneak in some extra veggies.